We Maximize Reach through the Power of Simplicity." We take pride in delivering a great product to each market area to help local businesses build their brand and sell their products and services. 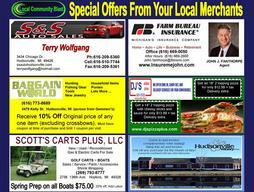 Each Local Community Blast is printed with 7-11 local business ads. The full color, 8x10" postcard is printed on heavy 14 pt stock with high gloss finish for maximum impact. 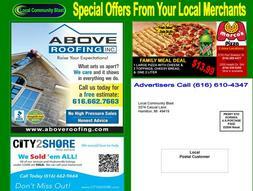 Each Mailing goes to approximately 5000 residents in the local market. 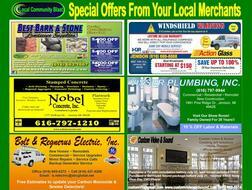 Local Community Blast Can Guarantee Each Advertiser nearly 100% exposure. You pay as low as 6 Cents per home. Building your brand is our business. Local Community Blast direct to your nearest customers! With our unique, 8x10 glossy design, each eye-catching Local Community Blast mailer attracts the attention of the consumer as they sort their mail and most consumers automatically flip the card to view both sides. This gives most ads 100% exposure. We mail to each residential address at least 3 times per year in our active markets. Our low-cost, high-exposure program is one of the best in the country at only 6 cents per residential home. We take your copy ready artwork and graphics or help you design your ad at no extra charge. We have multiple residential zones you can promote your business to...just ask our Sales Rep or Area Director for your market.